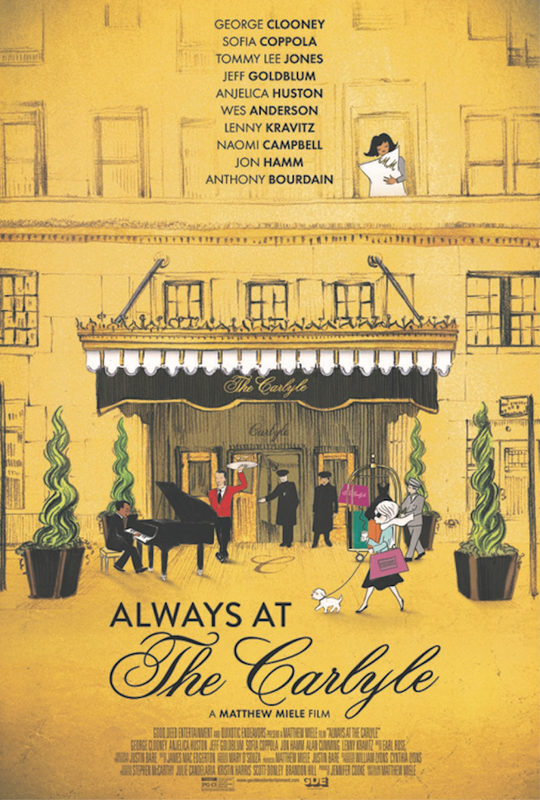 Possessing a "cast" that includes George Clooney, Anjelica Huston, Tommy Lee Jones, Harrison Ford, Vera Wang, Anthony Bourdain, Roger Federer, Wes Anderson, Sofia Coppola, Jon Hamm, Lenny Kravitz, Naomi Campbell and Elaine Stritch, ALWAYS AT THE CARLYLE will delight celebrity watchers of all stripes. Actually it will delight anyone who has ever heard of the legendary hotel or just likes to hear good stories. Light fluffy and certain not to stick to your ribs, ALWAYS AT THE CARLYLE is ultimately a puff piece about what is by all accounts a great, but expensive hotel. Lets face it most of us can't afford to stay there and this is going to be closest we ever get. Why won't we get there? Because the cost of a room starts around $500 a night, and goes up to the cost of a luxury car or small house. That said, it does have legendary bar, restaurants and the Cafe Carlyle inside it so we mere mortals can potential enter and spend at least part of an evening there if we want to spend a couple hundred bucks to see a legend perform in an intimate space. The film is collection of remembrances of the hotel by the staff and lots of famous people (only a small portion of which are listed above). It is a glowing mash note to the hotel by people who absolutely love the building. Its so glowing that you can't help but smile, in part because the stories are so good, but because many of the celebrities let there guard down and see genuine. For example Harrison Ford trying to get the film crew to let him stay in the room they are interviewing him in when the shooting is done. Its utterly charming. To be honest while I had an absolutely delightful time watching the film, it was an unexpected treat for me, I did have two small problems with the film. First it is really positive about the hotel. I know the filmmakers probably had to keep the slant positive to shoot in the hotel, but this can be a bit too much. The other problem is the arrangement of the story is a little odd. Other than generalities, we really don't begin to get an over view of the history of the hotel until almost 25 minutes in. Its not fatal but until we get it the stories of the hotel are kind of un-tethered as if we are simply reading a society column. I really liked this film a great deal. I loved the stories and the video of things that happened there-so many Cafe Carlyle moment to mention. While I know I don't know when I'll have the urge to see it again, it delighted me enough that as soon as I finished it I started to tell my friends and family about this sweet little gem. Or to put it into a very mercenary way- this film is worth your time and money, especially if you want something frothy and celebrity filled.